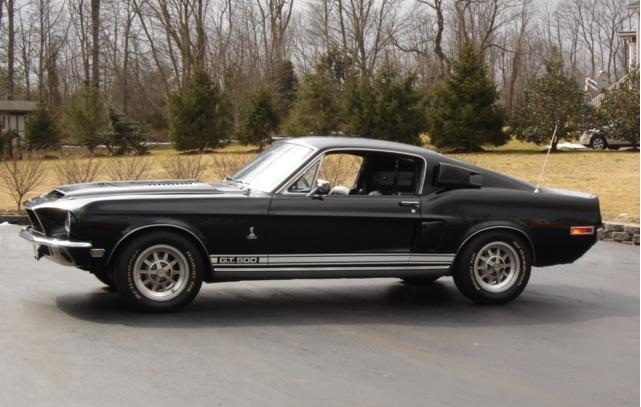 The Best 1968 Shelby Webpage !!! Engineering cars were used by Shelby to test various components and features not found on regular production cars. The history of most engineering cars had been largely ignored until recently. 8T02S113607-00101 is one of the first 1968 Shelbys built. It shares many of the features found on other early built cars. In September of 1967, months before regular Shelby production started, a handful of cars were assembled. These cars are sometimes referred to as "pilot cars". These cars were assigned to the Shelby Engineering Department. The information found on # 101 also indicates it is part of the history of Electronic Fuel Injection (EFI). Fred Goodell, Shelby's Chief Engineer, was a proponent of fuel injection. He found that the EFI systems provided a much better fuel delivery system than the carbureted models. It's hard to believe, but in the late 1960's Shelby Automotive was on the cutting edge of what later become an industry standard. Most people are familiar with the California Special prototype, commonly referred to as the "Green Hornet". This was one of the cars assigned to Shelby Engineering. From the time period 1967 to 1970, Shelby engineers had installed Electronic Fuel Injection systems on over a dozen cars. They experimented on both big blocks and small blocks. EFI was not the only thing Shelby engineers experimented with. They tested radios, superchargers and various other components. Most likely several different types of EFI systems were tested. Goodell favored a system made by Conelec. Conelec was a smaller company from New York, but Goddell felt they would be able to provide enough EFI systems for production. He also felt the system had several advantages over the more common Bendix- Bosch set ups. Determining the exact Shelby build date of a car is never easy. 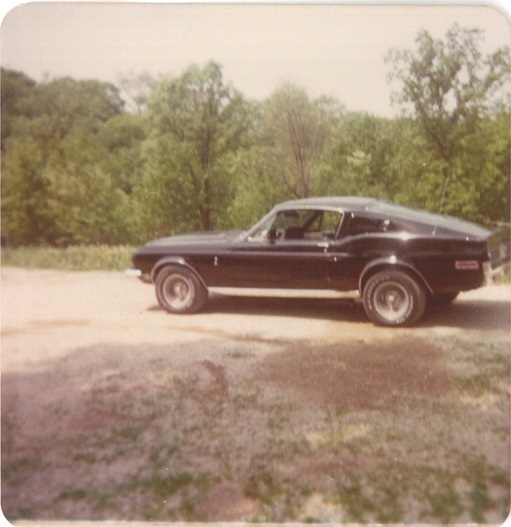 We usually can figure out the Ford Mustang build date and the date the car was shipped from Shelby to the first dealer. This leaves us with a window. In the case of # 101, we know the car was still be used for testing as late as January 1969. In other words, the exact Shelby conversion date was somewhat of a mystery until fairly recently. By carefully studying the records and the physical features of the car, there is little doubt it was one of the first Shelbys built in Septemeber of 1967. 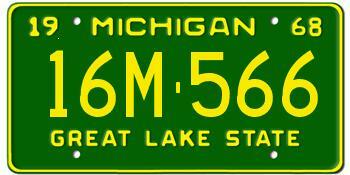 This manufacturer's license plate was used on # 101. The car is listed as having a "sound package". The original thought this related to stereos and speakers. It was later determined that the "sound package" was extra sound deadner sprayed inside the car. 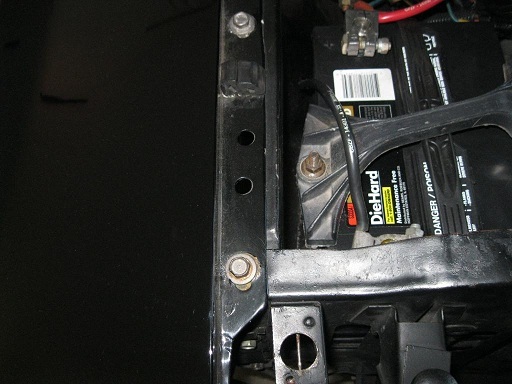 These holes in the front of the left fenders, closely match the location of a fuse panel that was installed on the Conelec Fuel Injection cars. The computer would have been mounted just forward of the radiator support. Some of the fuel injection drawings and blueprints have been found. The holes in the gas tank filler neck were most likely used for a fuel return line. Unused fuel was returned to the tank. You can also see the unique tail light treatment. The production method of dimpling the rear valence and the standard block off plates had not been developed yet. 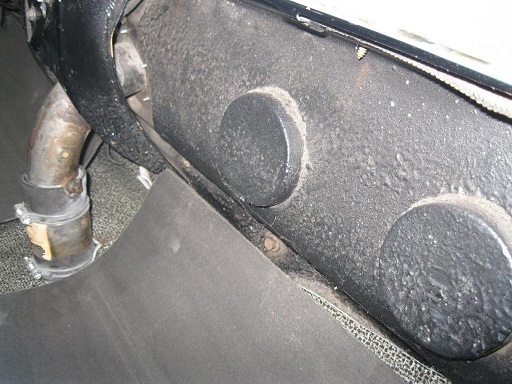 One theory suggests that the extra sound deadner in the trunk was an attempt to quiet the car for stereo radio testing. Most likely all of the unique fuel injection parts were removed, before 101 was sold as a "used car" to Courtesy Ford in Littleton, Colorado. It is likely the original GT500 motor had already been replaced with a service engine. That's was in 1969. The car had remained at Shelby engineering for nearly two years! According to the Shelby Club, the first owner was GW Aschenbrenner. He sold the car in 1976 to a Jan Dansdill. Dansdill sold the car after four years to Gail Rhoten. Rhoten installed a 427 side oiler in the car. The car was sold in 1990 to Gregg Cly. Cly painted the car black. Cly, in turn, sold the car to Webb. It was passed on to Edwin Parks of Alabama. 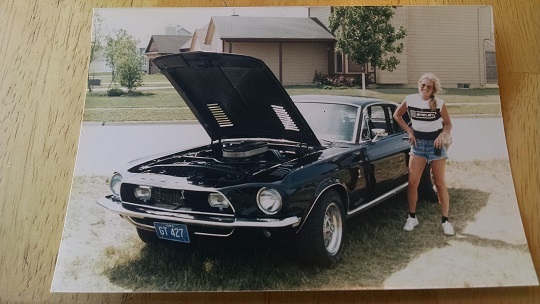 When Tom Conzo purchased the car in 1993, he did an excellent job of documenting the car. The engineering history of the car was known to many of the previous owners. But, finding information on the details was difficult. When Tom was ready to sell the car, the new owner knew he had a special opportunity. This may be one the first engineering cars to have changed hands in the last twenty years. The current plans for the car are to drive enjoy it. Eventually a restoration may be on the table. But, the new owner has indicated he wants to learn even more about the Conelec Fuel system and the engineering cars. Personally, I think that's an excellent idea. Engineering cars will become more sought after in the coming years. Collectors and enthusiasts are only now beginning to understand their historical significance in shaping the modern cars of today. The new Shelby World Registry will feature a special chapter on engineering cars. The restoration of 101 has begun! Step one of any restoration is validation, research and documentation. So, I wasted no time in rounding up anything that related to this unique car. This handwritten memo was written before Shelby moved to Ionia. It's a planning document for the move. 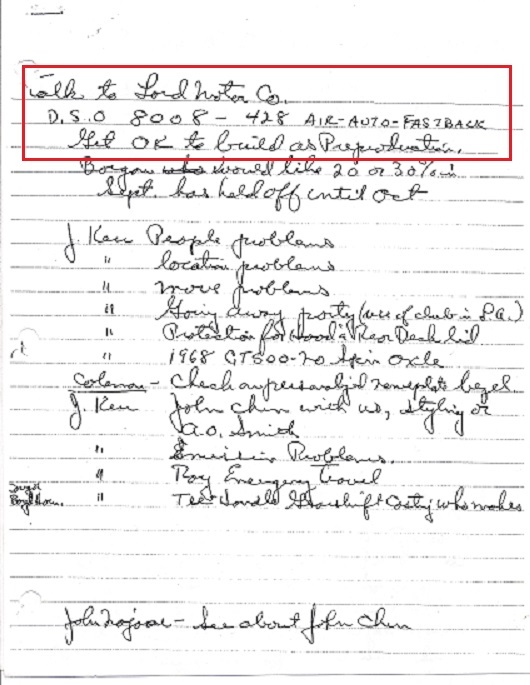 The highlighted area reads, "Talk to Ford Motor Company..DSO 8008 Air-Auto-Fastback- Get Okay to build as preproduction"
There is no car with a "8008" DSO code. So, I interpret this to be 1968 DSO - 008. That is the correct code for # 101. Another document that came to mind was this inventory sheet from the factory. It is dated January of 1969. 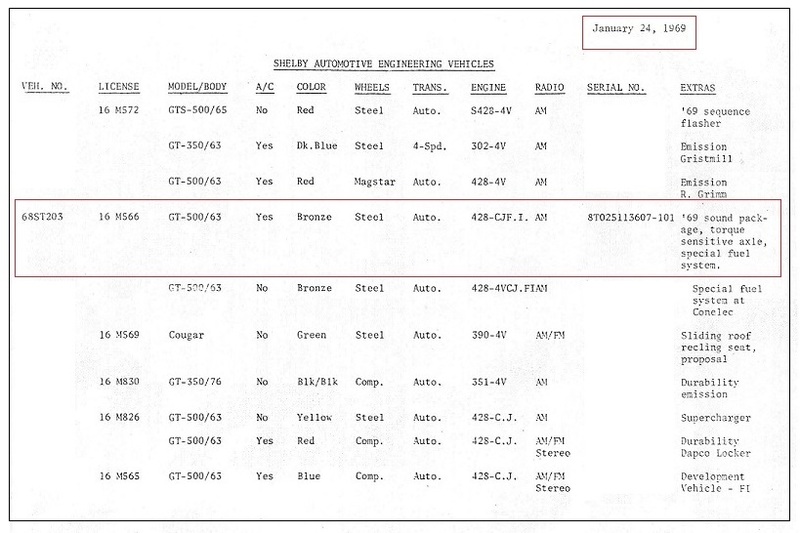 (The document shown is modified to protect the identity of vehicles listed). The sheet calls out # 101 as being equipped with the following features: Air Conditioning, steel wheels, automatic transmission, 428 Cobra Jet with Fuel Injection, an AM Radio, a torque sensitive rear axle and special sound package. That makes this one of the most unique GT500s ever built by Shelby Engineering. The previous owners were tapped on the shoulder again. We were very lucky to receive pictures. These pictures show the car through the years. #101 was originally Sunlit Gold (listed as Bronze on the document above), but it has been black since the mid-1970s. This picture was incredibly interesting. Taken in the 1970s, it's unlikely this is a reproduction ram air chamber. It is also not a production part. Very likely #101 was the first ram air car built in 1968 and this is the prototype ram air chamber. Once the car was disassembled, evidence of the Gold paint was found. #101 is stripped down and ready for the body and paint men to enter. These bumpers are similar to a 1967 Shelby. They were discountinued before regular1968 production started. The rear axle and other suspension components are detailed and installed on the car. Under the dash, the firewall pad is put in place. If you want it to look original, you will need to be creative. 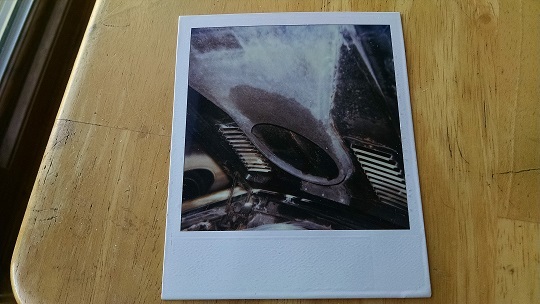 I am working on the inside of the car. Every component, even those hidden away, is refurbished. 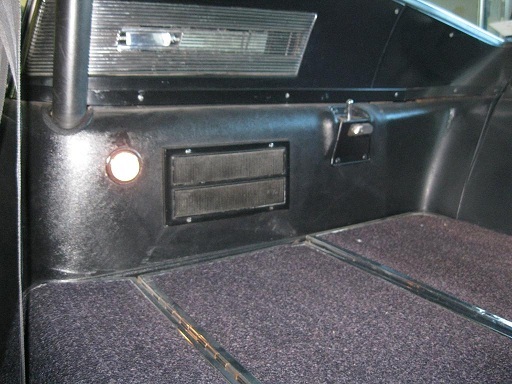 The additional sound deadner and jute padding was added by Shelby engineers. You might have noticed the speakers are gone. It was determined the "sound package" engineering note refers to additional sound deadner and not a radio/speaker upgrade. All 1968 Shelbys had two metal pin hood pin plates that were riveted to the hood. The rear valence and lights are installed. The exterior looks like the production cars. Sometimes, it seems like you are always waiting for parts. The dash is installed. It's a shame that the work behind the dash is covered up. The car features air conditioning and the restoration of those underdash items went great. There is a great dealing of plumbing and wiring on the firewall. 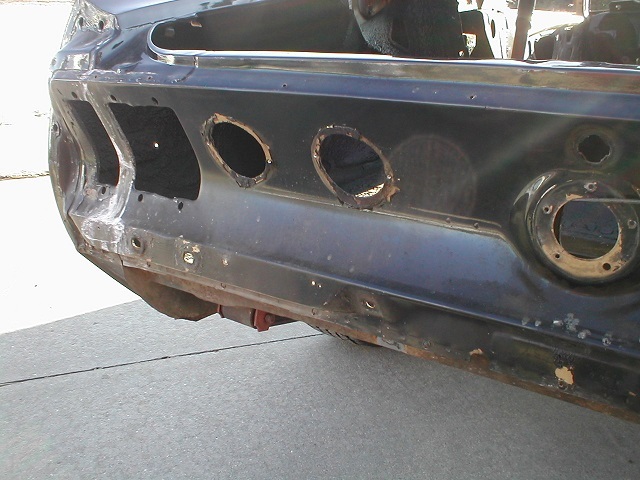 I want to get that all in and correct before spraying any sealers or installing the engine. Speaking of engines. 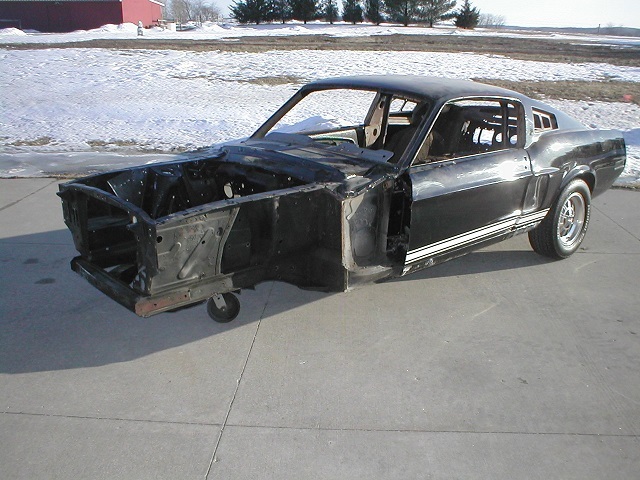 This car was originally equipped with a 428 Police Interceptor motor. The Shelby engineers removed that and replaced it with a 428 Cobra Jet engine. This is an original 1968 date coded 428 CJ . It was rebuilt and is now ready for dyno testing. I like to run the engine and then paint it. After painting it, the detailing starts. It's never too early to start rounding up all the small parts that will make the engine look like it did in 1968. These details separate a good job from a great job. The engine will be equipped with the Conelec EFI system. Here is an original Conelec EFI throttle body and sensor box. The EFI throttle body for 101 is on the right. Almost every piece of the system has been remanufactured to original Conelec specifications.